Get a line pass for a couple perfect training days. Find out more. Most MVP classes max out at 60 students. We’ve reserved 30 places in each class for early sign up. The remaining 30 spots will be filled at on site sign up one hour before the session is scheduled to begin. Want reminders when we open early sign up? We email the address you give us when you purchase your RollerCon pass, and you can text “follow rollercon” to the phone number 40404 to get an SMS reminder. If you purchased an MVP Pass, you are eligible to sign up in advance for two MVP classes. If we still have a lot of spots available, we may open a third class for everyone on JUNE 29th. MVP Passholders must have purchased their MVP pass prior to the Early Sign Up dates to be eligible for early sign up. We pull reports the night before. SIGN UP HERE (on the real form!) when it opens June 15th at NOON PST. It is possible that the coach may cancel or reschedule a session. We’ll contact you at the email you gave us if that happens. Please make sure your email is accurate. Q: Why only two classes (or maybe three)? A: That’s how the math works out. We know that there are a lot of MVP passholders that do not typically take classes, but we have to assume that they all might. 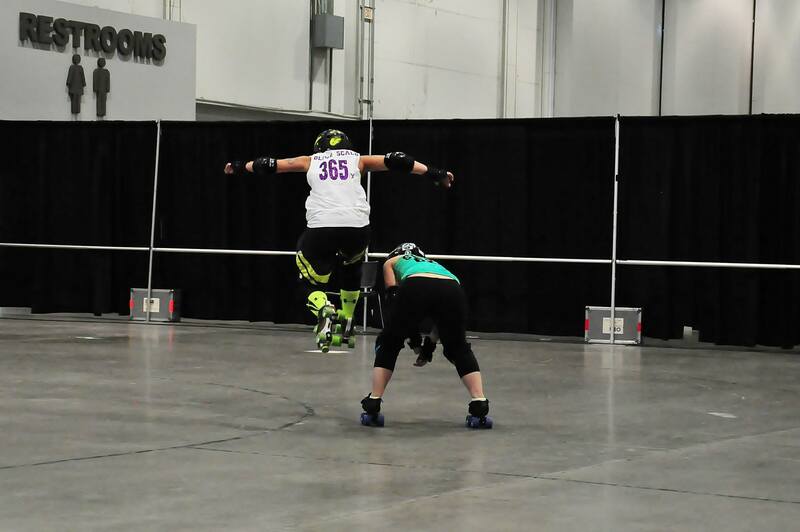 Check out the current schedule (scroll to RollerCon dates!) to start planning your signup classes! Some are marked with 5 stars. Find our more about our MVP Star Rankings. MVP classes max out at 60 students. We’ve reserved 30 places in each class for early sign up. The remaining 30 (or more) spots will be filled at on site sign up one hour before the session is scheduled to begin. On Site MVP Class Signup is across from Volunteer Check in (VCI) in the RollerCon registration lobby. Look for Ballroom D.
We’ll sign up all remaining spots 1 hour before each class starts (until its is full). A whiteboard outside the pre-registration area will list which classes we’re registering at that time. MVP passholders can register for one class at a time. Each person must signup for themselves; you can’t sign up for someone else. Door people will check your badge and your ID to enter the MVP area and clerks will use them to register you for the class session. Classes are all labeled by skill levels. We can’t register you for a class that doesn’t include your skill level. 30 minutes before the class starts, pre-registered people on the upcoming class roster will be allowed to line up at the track door. Students are welcome to begin gearing up in the hall, but please do not put on skates in the hall or area outside the tracks. When the previous class exits, the next class will be welcomed in to put on skates and begin the session. Our MVP Sign Up area is just beyond the MVP Lounge. You are welcome to hang out in there until sign up begins for your class. RollerCon does not endorse, enforce or manage lines in that room, but we do strongly encourage everyone to organize according to principles of fairness and Rule #1 (Don’t be a douchebag). In other words, if someone is waiting longer than you, let them go in before you. Please be cool.